Crete: Ancient Diet with Modern Message The traditional cuisine of the Greek island of Crete — and its emphasis on fruits, vegetables, whole grains and pulses — is one of the most healthful in all the Mediterranean. The nutritionist's dream diet is like eating in the Garden of Eden. 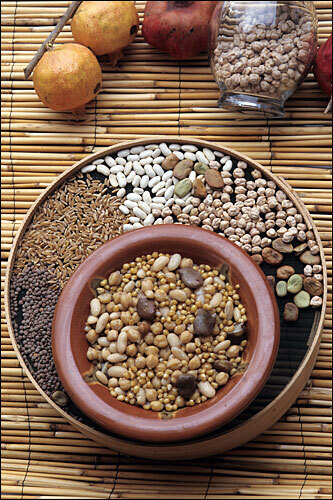 Residents of the Greek island of Crete enjoy a healthy diet that emphasizes fruits, vegetables, whole grains, olive oil and pulses — the dried seeds of legumes such as lentils, beans and peas. 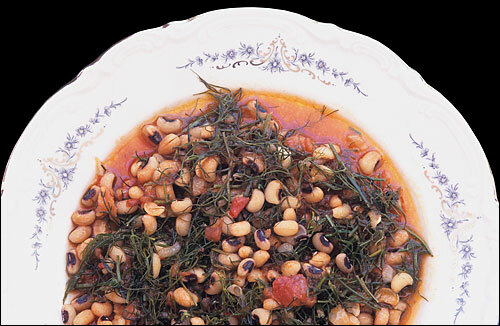 Recipes for black-eyed peas with fennel and lamb with greens, artichokes and avgolemono sauce. Rusks, biscuits that resemble zwieback but are 100 times as hard, are eaten saturated with olive oil and sprinkled with oregano, slathered with eggplant dip or olive paste, or topped with chopped tomatoes, soft cheese and oregano — a typical Cretan tavern food called dakos. Bonny Wolf is Kitchen Window's contributing editor and a commentator on NPR's Weekend Edition Sunday. Her book of food essays, Talking with My Mouth Full, is out in stores. You can find more information at bonnywolf.com. My friend Louis says Crete is the Garden of Eden. He spent two months hitchhiking alone across the Aegean island and says he could have eaten enough simply by picking food off trees and through the kindness of strangers. As he walked down a road one day, a woman stopped him, unfolded her apron — which was filled with white, red and pink cherries — and insisted he help himself. Villagers invited him into their homes for meals. The good people of Crete firmly believe that no one should eat alone. They are healthy and long-lived, they say, because they break bread and drink wine together. Their diet also helps. Historically, Cretans have eaten only what their land produced: lots of fruit, vegetables, whole grains and pulses — the dried seeds of legumes such as lentils, beans and peas. One thing the island produces in abundance is olives. So the Cretans eat a lot of olive oil — more than other Mediterranean people. And they don't use any other type of oil, even to make sweets. The sunny island with high mountains and deep valleys also provides herbs and aromatic plants, fruit trees and vegetables, wheat and barley. It's also a place where salads are a large part of the diet: There is a saying that goes, if you have a field, don't let a cow or a Cretan in. They'll eat all the greens. The small amount of animal protein eaten on Crete is cooked in olive oil and usually made with greens, grains or pulses: sea bass with purslane, pork with cracked wheat, chicken with peas. All these foods are made simply and quickly with no cream and few spices. In other words, Crete offers a nutritionist's dream diet. Nikos Psilakis, a founding member of the Greek Academy of Taste, wants to educate the world outside Crete, as well as younger generations on the island, about the Cretan diet. During the past few weeks, Psilakis has been giving impassioned presentations in the Northeastern United States, and I recently caught the show — and some wonderful food --at the Greek embassy in Washington, D.C. The merits of the Mediterranean diet, Psilakis reminds his audience, have been accepted doctrine for decades. What he wants us to know is that the diet of Crete, the largest of the Greek islands, is the most healthful in the Mediterranean. Psilakis cites studies showing that the people of Crete have the lowest death rate from heart disease and cancer in the world, and he credits the lifestyle and traditional diet — that of the poor Cretan farmer. The Cretan diet includes about three times more bread than the average American eats, but it is all made from whole grains, loaded with healthful fiber. But as the once-isolated island becomes more globally connected, its traditional diet faces greater competition. To preserve the recipes and reinforce their importance, Psilakis has been scouring documents and talking to islanders, and is compiling a written record. He makes his points with bar charts and photos of the healthy people and beautiful countryside of Crete. This, combined with the food served, makes a convincing argument. Psilakis' presentation was accompanied by typical Cretan hors d'oeuvres: spreads made of eggplant and fish roe, lots of raw vegetables and olives, and tiny, lightly fried cheese turnovers called kallitsounias. Since hearing Psilakis' presentation, I've become a big fan of the Cretan "rusk," which is like zwieback but 100 times as hard. Rusks are made with barley, wheat or rye flour, and double baked. With all the moisture sucked out, the bread lasts for months. 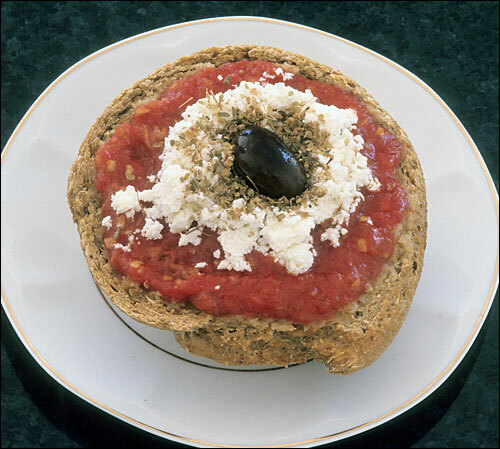 Rusks are eaten saturated with olive oil and sprinkled with oregano, slathered with eggplant dip or olive paste, or topped with chopped tomatoes, soft cheese and oregano — a typical Cretan tavern food called dakos. These snacks were followed by a multi-course, multi-hour, sit-down dinner of many typical dishes of the Cretan diet and some pretty good Cretan wine. We had zucchini pie, black-eyed peas with fennel, and lamb with greens and artichokes, a spring favorite. Chicken was cooked with dill, cuttlefish with their ink and wine, octopus with chickpeas. About three hours in, we got a slab of lamb ribs cooked with honey and a side of potatoes with oregano, olive oil and lemon juice. Psilakis says Crete even has special bees that make particularly good honey. We were served slices of Gruyere drizzled with honey for dessert. It was like eating in the Garden of Eden. Read last week's Kitchen Window: rockfish. Pulses have been an important part of the Cretan diet since antiquity. 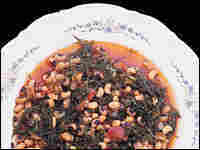 Traditional dishes often pair the dried legumes with greens and herbs. 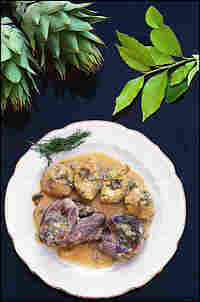 The following recipe is adapted from Cretan Cooking by Maria and Nikos Psilakis (Karmanor 2000). Put the black-eyed peas in a saucepan, cover with water, bring to a boil. Reduce heat to a hearty simmer and cook for 15 minutes. Drain. Heat olive oil in a large saucepan and saute fennel and onion until limp. Stir in tomatoes or tomato paste and simmer for 10 minutes. Add the beans, salt, pepper and water to cover. Simmer until the water is absorbed and the sauce thickens. 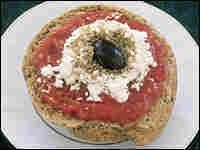 This is a typical spring dish in Crete. You certainly can prepare fresh artichokes for this recipe, but it is a lot easier to use frozen artichoke hearts, which work very well. The sauce of lemon and eggs is common in Greek cooking. Heat oil in saucepan large enough to hold all ingredients. Add meat and, over medium heat, brown on all sides, adding a little water if meat begins to stick to bottom of pan. If using fresh artichokes, peel, cut out heart and place in a bowl. Cover with water, salt and a little lemon juice. If using frozen artichokes, defrost in bowl of water with salt and lemon juice. While meat is browning, cut artichoke hearts in half and roughly chop onions and dill by hand or in a food processor. When meat is browned but not cooked through, add prepared vegetables to the pot with 1/4 cup water. Cover and cook over low heat for about 1 hour. While meat and vegetables are cooking, prepare avgolemono sauce. Separate eggs. Beat egg whites until foamy. Add yolks, then lemon juice and a little stock from the meat pot, beating constantly until slightly thickened. Remove meat and vegetables from heat and mix in sauce. Olive oil in cake? You'll be surprised how the olive oil keeps the cake super moist. Make sure you use a floral olive oil rather than, say, a peppery one. This recipe is from Holiday Baking: New And Traditional Recipes for Wintertime Holidays, by Sarah Perry (Chronicle Books 2005). Preheat oven to 350 degrees. Lightly grease the bottom and sides of a 9-inch round cake pan with cooking spray. Line the bottom with a round of parchment or waxed paper. In another medium bowl, whisk together the eggs and sugar until well blended, about 1 minute. Whisk in the olive oil, milk, orange zest and orange liqueur. Whisk the egg mixture into the flour mixture until thoroughly blended. Pour the batter into the prepared pan and bake until the cake is firm and a toothpick inserted into the center comes out clean, about 30 minutes. Transfer the pan to a rack to cool for 20 minutes. Meanwhile, scatter the almonds in a single layer on a small baking sheet or pan and toast in the oven until slightly brown, 8 to 10 minutes. 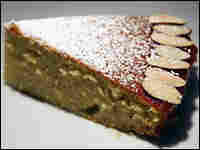 To serve, unmold the cake, remove the parchment paper, and place the cake on a flat serving plate. Using a pastry brush, coat the sides of the cake and a 1-inch rim along the top with the warm marmalade, arranging any bits of peel along the rim. (If the marmalade is too thick, add 1/4 teaspoon warm water and stir.) 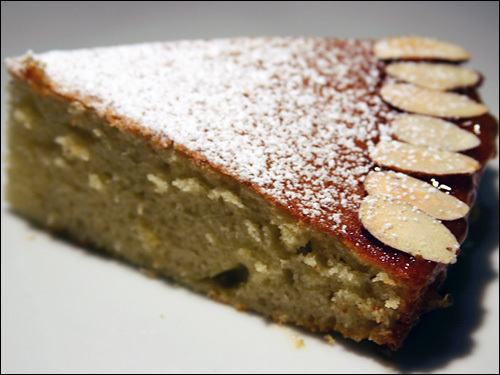 Press the almonds onto the sticky top rim. Using a fine sieve, lightly dust the powdered sugar evenly over the top. Serve warm or at room temperature.